How does your school's spending compare? 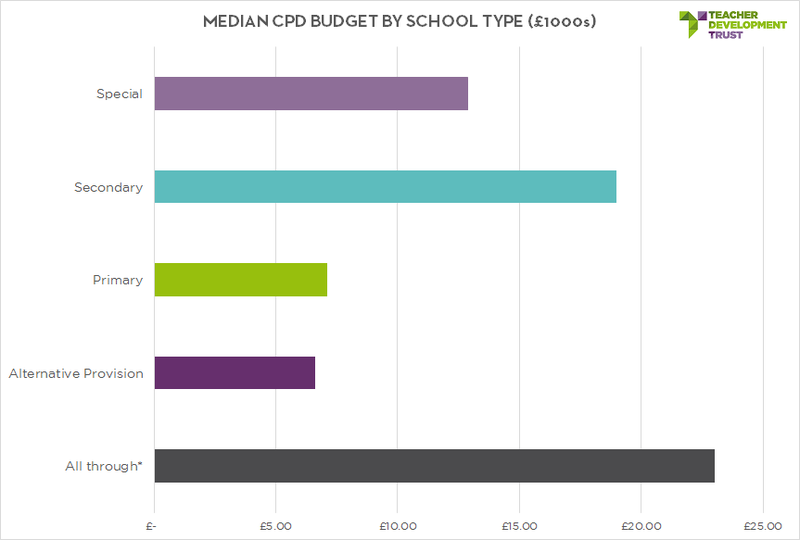 Compare your school’s CPD budget using our benchmarking tool here. A Postcode Lottery for Teachers? The Teacher Development Trust conducted a more up-to-date analysis of CPD Spending in April 2018 to find that the average full time teacher in Hampshire, Secretary of State Damian Hinds’ constituency, had four times the professional development budget compared to the average full time teacher in Bury. The Teacher Development Trust has analysed school budgets from state-funded schools across England. 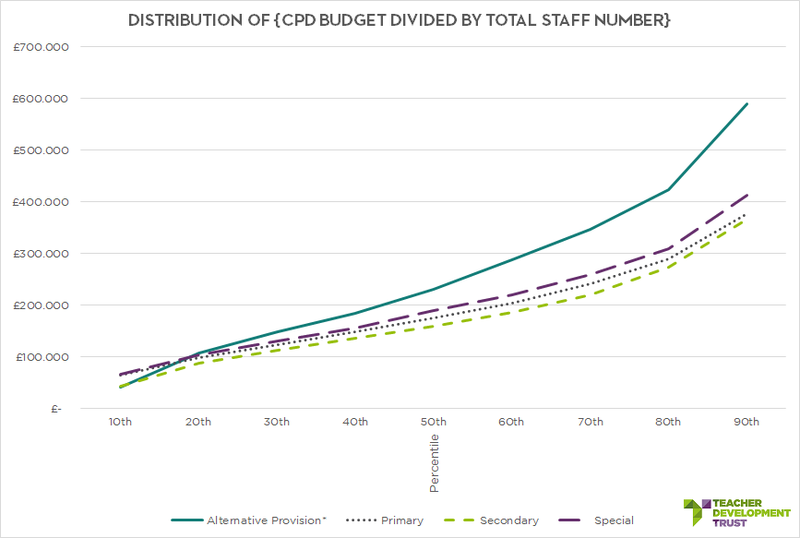 Using the latest financial figures we have produced a tool to help you compare your CPD budget to other schools of your type (primary, secondary, special or all-through). 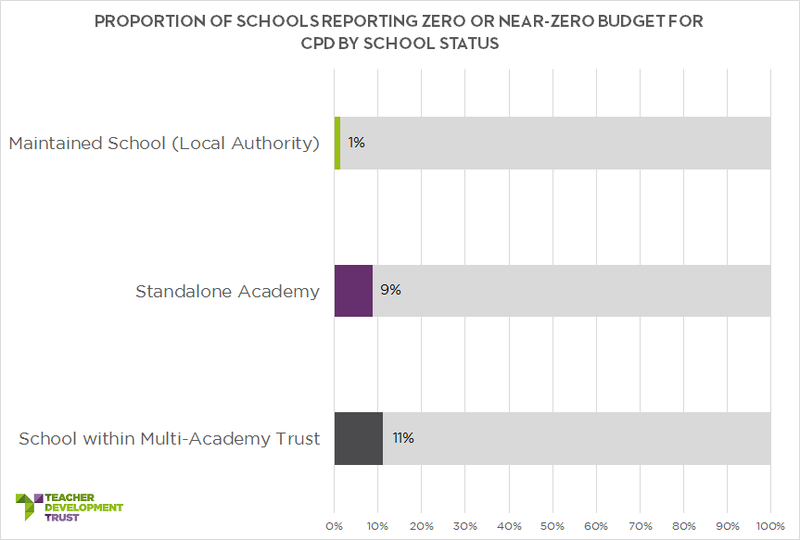 Just over 21,000 teachers are employed in schools which report zero or near-zero CPD budget. We think some of the schools in MATs amalgamate spending at the MAT level so this figure may be a little high, although standalone academies are unlikely to use such an approach so perhaps it is associated with academy status? This warrants further investigation. 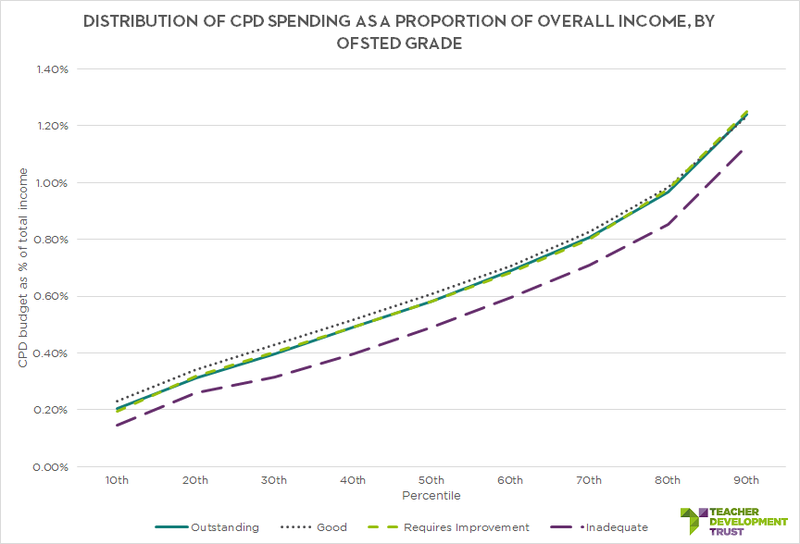 Schools rated Inadequate by Ofsted spend around 20% less on CPD than other schools, as a proportion of their total budget. 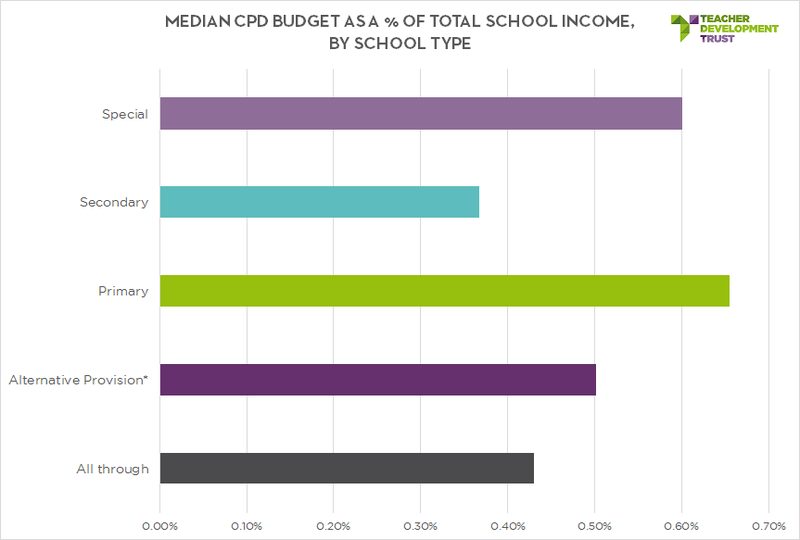 Across the sector, the median spend on CPD is 0.7% of the school’s overall budget. 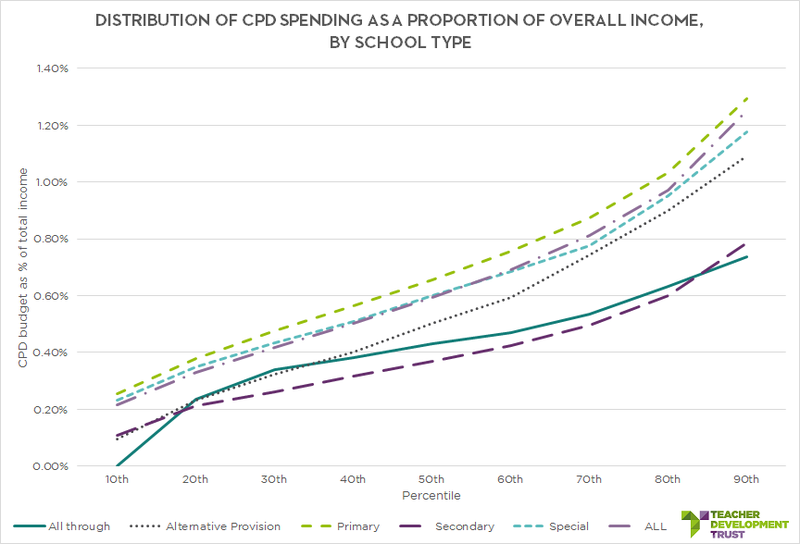 The total of all schools’ CPD budgets is around £255 Million. This may excludes any related spending on cover costs or CPD built into resource materials, IT products or school improvement services, for example. It also excludes Local Authority, central MAT and national government spending on professional development. The average spend on staff development per pupil is just £33. Here are two “per head” analyses. 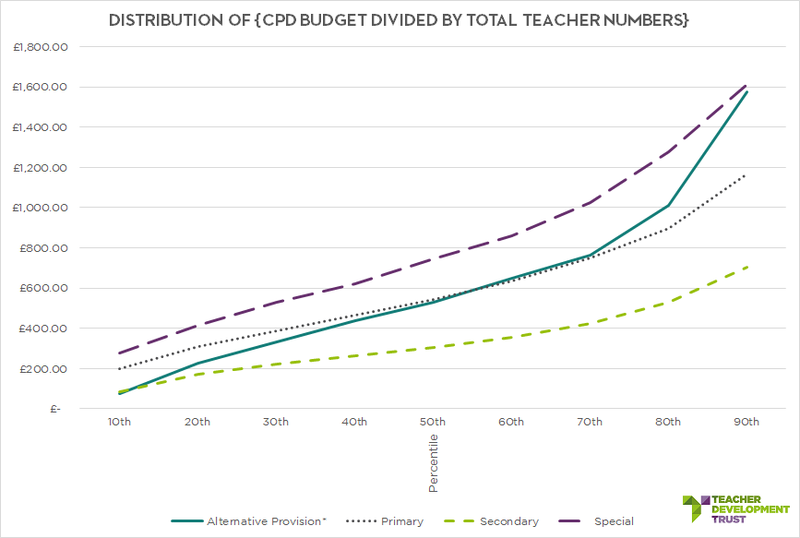 The first takes school CPD budgets and divides by total teacher headcount. The second divides by total staff headcount (all staff). Note that special and alternative settings seem to have inconsistencies in recording different types of staff leading to large disparities. Note also the sharp difference in per-teacher spending between primary and secondary nearly disappears when comparing per-staff-head. The analysis was carried out in December 2016. Spending data was retrieved from the Department for Education – https://www.gov.uk/government/collections/statistics-local-authority-school-finance-data. We used data from category E09 – Development and Training from the Consistent Financial Framework for maintained schools. We used the “Staff Development and Training” category for academy financial returns. We used school URN codes to match this data with staffing data from the School Workforce Return – https://www.gov.uk/government/statistics/schools-pupils-and-their-characteristics-january-2015 – and the August 2015 Ofsted data giving the latest (at the time of analysis) inspection results from schools – https://www.gov.uk/government/statistics/maintained-schools-and-academies-inspections-and-outcomes-as-at-31-august-2016. Note that the spending data for thew 2014/15 financial year did not specifically identify all-through schools. The benchmarking tool uses 2013/14 spending figures for these schools as this data set did specifically identify all-through schools. 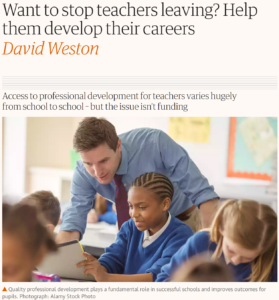 In April 2018, the Guardian published our piece on our latest analysis of CPD spending figures.